Beginning quilters may seem overwhelmed by the lingo, fabric choices and stitching techniques needed to create masterful pieces of art from cloth and needle. Luckily, all you have to do is learn good quilting habits early so you don’t have to change your approach later. Get started the right way with these tips and tricks for beginning quilters. Fabrics are vital to the set up of your quilt. Pure cotton behaves differently from polyester, and denim has different properties from linen. Fabrics have different care instructions, so take those into account before you decide to wash your quilt scraps ahead of your sewing project. Normal sewing projects need a 5/8-inch seam between pieces of cloth, but quilts require a 1/4-inch seam for greater accuracy over the entire piece. Make sure your sewing machine has the right feet for this smaller seam. Practice on scraps to make sure you get your seams right before embarking on an entire quilt. Take three pieces of cloth, each 1 1/2 by 5 inches, and sew them with a 1/4 inch seam. Stretch out the three pieces after you sew them together. If the middle piece is exactly 1 inch wide, your 1/4-inch seam is perfect. Rotary cutters and tools let you cut fabrics faster and easier compared to scissors. Once you cut pieces, stack them up so all of the same types of fabric remain together. 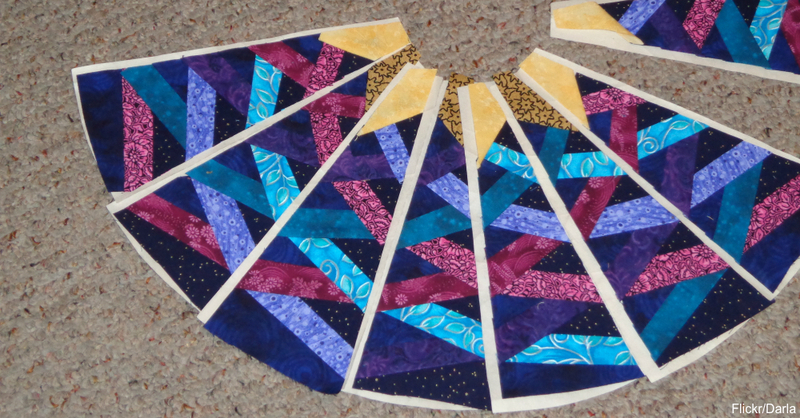 This saves time later, as you go through a complicated quilt. Lay out your fabric ahead of time so you get an idea of what you want the finished product to look like. Then you can decide what you should strip and chain together before you cut any fabric. This saves several steps later, improves accuracy and cuts down on the number of seams you need to make. Learn that two triangles can make a square and that other shapes can go together to make patterns. Chain piecing is a technique by which you don’t finish the seam on one piece all the way and then add another piece of fabric to continue to make the proper shape. Press your fabrics with an iron before you run it through your sewing machine. This improves accuracy and actually saves time later so you don’t have to rip any stitches out. Set your iron for the right fabric setting and press the fabrics by raising and lifting the iron rather than moving it side-to-side over the fabric. Side-to-side movements stretch the fabric unnecessarily. Press in the direction of the seams so your stitches are more accurate. Leave enough room on the edges for mitered binding. Cut strips of fabric the exact same width to go around the entire outer edge of your quilt. Create that gorgeous 1/4-inch seam you’ve been practicing to make your edges look great. Mitered binding helps keep all three layers of the quilt together. You want your colors to match as much as possible, and you don’t want one color to dominate over all of the others. Learn complementary colors, supplementary colors, primary colors and every color in between so you recognize what goes together and what doesn’t.